As someone with a history of eczema and sensitive skin, I’m always excited to share new brands or products that are 100% natural for my readers and others who also suffer from eczema. Today, I wanted to share with you a brand that is becoming well-known in the adult and child eczema community: the Eczema Company! I’ve mentioned this company in other posts before, because it’s rare to find one that I really do trust. All their products are carefully screened so that there aren’t any chemicals, synthetic fragrances, parabens, or other things that could irritate your skin. In this post I wanted to review 3 of their eczema creams that just came in the mail! AND give you a special gift at the end of this article. 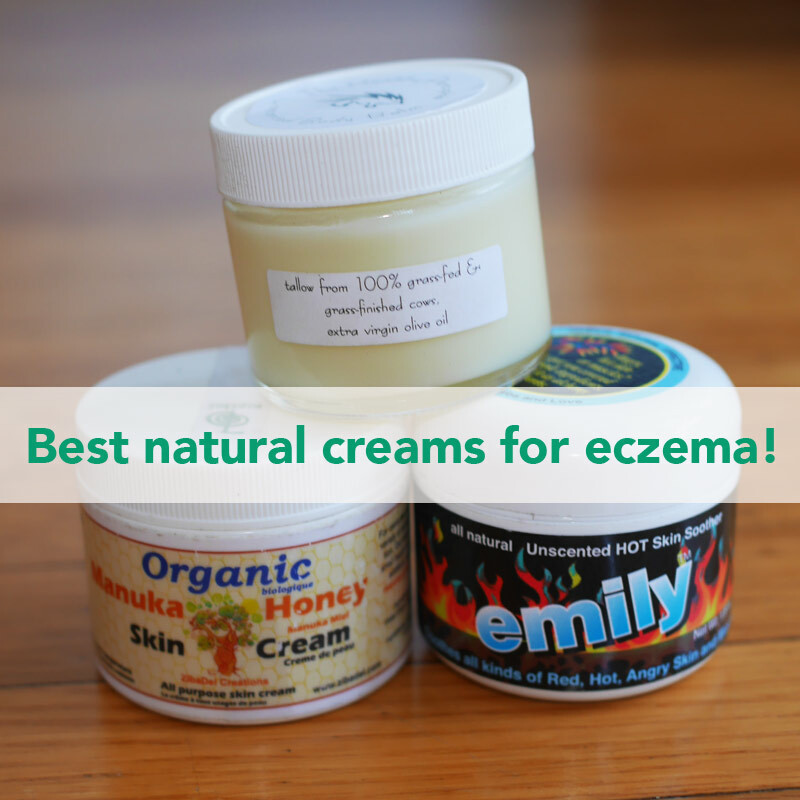 Why choose natural creams when you have eczema? If you have eczema, this is perhaps the first question you’re asking. While the eczema market is booming with many different types of creams, balms, ointments, and even injections that all claim to “heal” your eczema at a low cost, in reality the majority of regular skin products contain chemicals and substances that can damage your skin in the long run. Or worse, be actually making you breakout. In order to clear my eczema naturally, I spent over 3 years of research into what was REALLY safe to use on your skin, and what I found was surprising! According to the journal of Clinical and Aesthetic Dermatology, cosmetic products like moisturizers, balms, and creams are among the MAIN culprits of allergic contact dermatitis (eczema)! If you find yourself breaking out with your skin product, you may be reacting to one of these chemicals! Thankfully, these chemicals aren’t found in most NATURAL creams and products (and definitely not in the ones I’ll be reviewing for you today! ), making them the obvious safe choice to use on your skin. Switching to natural products that don’t contain chemical irritants, can dramatically improve your skin! — and for some, may even be enough to stop the break out altogether. Do natural creams work for eczema? Working with my clients who usually come from a long-history of steroid creams, I’m always looking for the fastest but still safest way to get them clear skin results! For those of you wondering, natural creams have been studied in the medical community, to work just as well (or even better!) than the average steroid eczema cream. In a well-designed study, 186 infants with atopic dermatitis (eczema) were assigned to use a non-steroid (natural) cream, twice daily for 6 weeks. At the end of 6 weeks, researchers found that more than half (56%) of the infants who used the natural cream were CLEAR or almost clear of eczema! Better yet, it was found that the need for future creams were significantly reduced. These results offer the prospect of effective long-term eczema management with natural creams, and can even reduce the need for future creams — saving you money in the long run! In a controlled study, researchers sought to compare the efficiency of a non-steroid (natural) product VS Hydrocortisone Butyrate (a steroid cream). Adults with eczema were brought in and tested with either the natural or steroid product. Each adult was observed for 12 weeks, and analyzed at different periods of time to check for improvement. At the end of the study, there was a clear winner! The non-steroid (natural) cream showed significant clinical improvement at each point in time, compared to the steroid cream (which seemed to work in the beginning, but stopped working at later points in time). Research has shown that natural creams are effective and can be used with success in eczema treatment! Additionally, they are so much more efficient long-term than steroid creams. If you’ve been using a steroid cream for a long time, and still aren’t having progress on your skin, I highly suggest using a natural cream to help things improve long-term and efficiently. What are the benefits of natural creams? Even if you don’t have eczema, using a natural cream can still improve your skin. – Healthier, happier, glowing skin! Personally, I’ve noticed a huge change when I switched to natural, non-toxic products. My skin doesn’t get as dry as it used to, I don’t have flaky skin or build-up on my skin, and my skin stays softer, brighter, and smoother for longer! – They don’t addict your skin. As I mentioned in my free video, the key to clear your skin, the average steroid cream can addict the skin — making your skin dependent on the creams. This can lead to an eczema-steroid cream-eczema cycle, where you constantly need to be using the cream. With natural creams, you eliminate this problem! Because they don’t contain steroids, you aren’t addicting your skin in the long run. – Less chemical build-up on the skin. Average moisturizers and lotions can often contain the main eczema irritants (mentioned above), and can cause your skin to flake, itch, and irritate existing eczema. Using a natural cream that doesn’t contain chemicals or irritants, helps your skin to be smoother, clearer, and you’ll have less chemicals on your skin. Naturally beautiful! – Non toxic for the young ones. High quality natural creams are often food-grade (meaning that if you accidentally eat it, you’ll still be okay!). As eczema is very common in children, it can be harmful to expose them to chemicals found in steroid creams and even in the average balms and lotions. Especially as children tend to put their hands in their mouths more often. 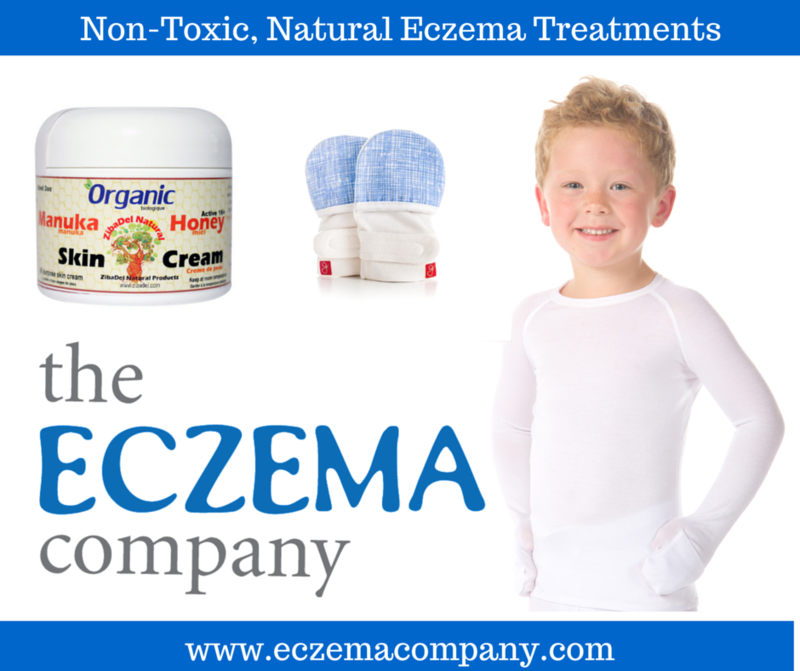 If your child has eczema, it’s best to choose a natural cream that won’t contain any harmful toxins. Well now that you’ve read all about how natural products can help your eczema, I hope you’re excited to get to some creams! I’m reviewing 3 creams from the Eczema Company, for different types of eczema. These are some of the bestsellers on their site, and I wanted to get a few for different types of eczema. For: weeping eczema, reddened skin, hot skin, inflamed skin, TSW symptoms. This will actually be my second time to feature this cream, because I’m a huge fan of its benefits! In fact, I almost wish I had this cream when I had eczema. The “Emily Hot Skin Soother” helps best with heat induced eczema. Heat induced eczema is eczema that worsens with water contact, sweat, moisture, and is commonly seen in the creases of the skin (elbows, back of knees, groin, and underarm areas). The balm contains a mixture of herbs that help to relieve the irritation and can also help with topical bacteria (like yeast or fungus). If you have eczema that weeps, angry red rashes, heat rashes, or are going through flare-ups from withdrawal symptoms from steroid creams, I highly recommend “Emily Hot Skin Soother” to help relieve the pain. For: extreme dry eczema/skin, flaky eczema, hard eczema, dry eczema. 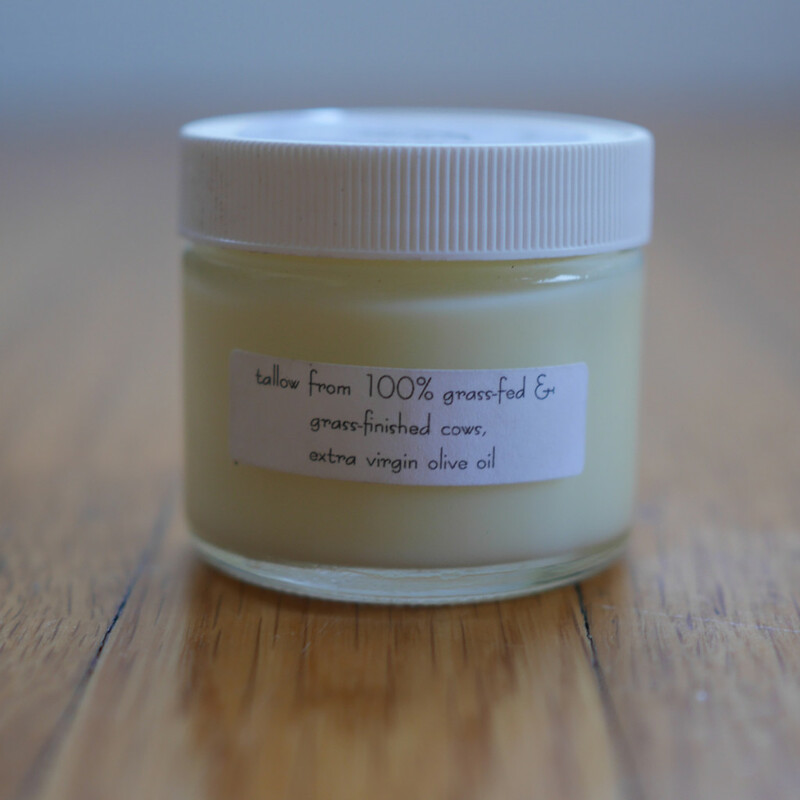 This balm is so simple in its ingredients, making it perfect for those of you with extremely sensitive skin. If your skin is always very dry, or even natural moisturizers (like coconut oil, shea butter, etc.) just don’t work for you– you NEED to try this balm. Tallow balm is one of the earliest and purest forms of skin care, and its benefits were long used by our ancestors to nourish and moisturize dry skin. 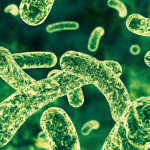 What makes tallow balm so unique is that it is HIGHLY compatible with the biology of our skin cells. Tallow is typically 50-55 percent saturated fats, and consists primarily of lipids called triglycerides. These triglycerides are also found in our skin’s natural sebum (in fact, did you know that “Tallow” actually means “Sebum” in Latin? ), and experts say that this is the primary reason for why tallow is so well-absorbed by the skin. 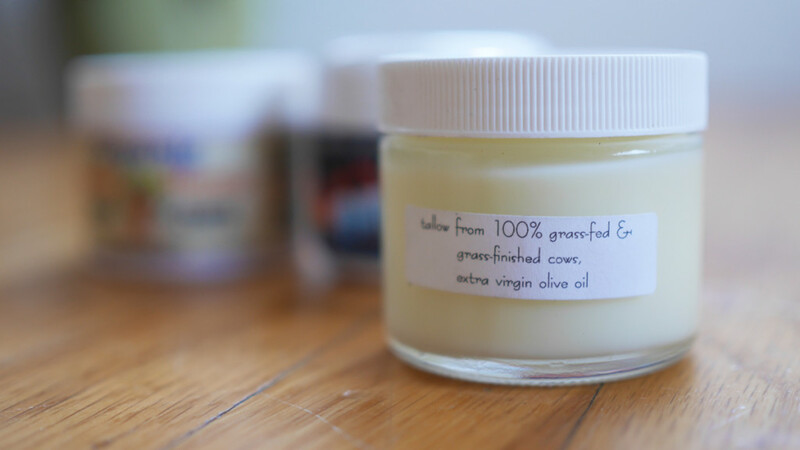 You can find it here: Grass-fed tallow balm. Available in unscented or lavender. For: all around moisturizer, mild-moderate dry skin and eczema. I have actually been using this cream for about two weeks now (since writing this), and it’s fast become one of my favorites as an all-around moisturizer! I use it every other day on my legs, arms and back — in the morning after I shower. Even though I only use it sparingly, I can already notice the difference! It keeps my skin moisturized throughout the day, and I don’t even need to apply a cream at night. 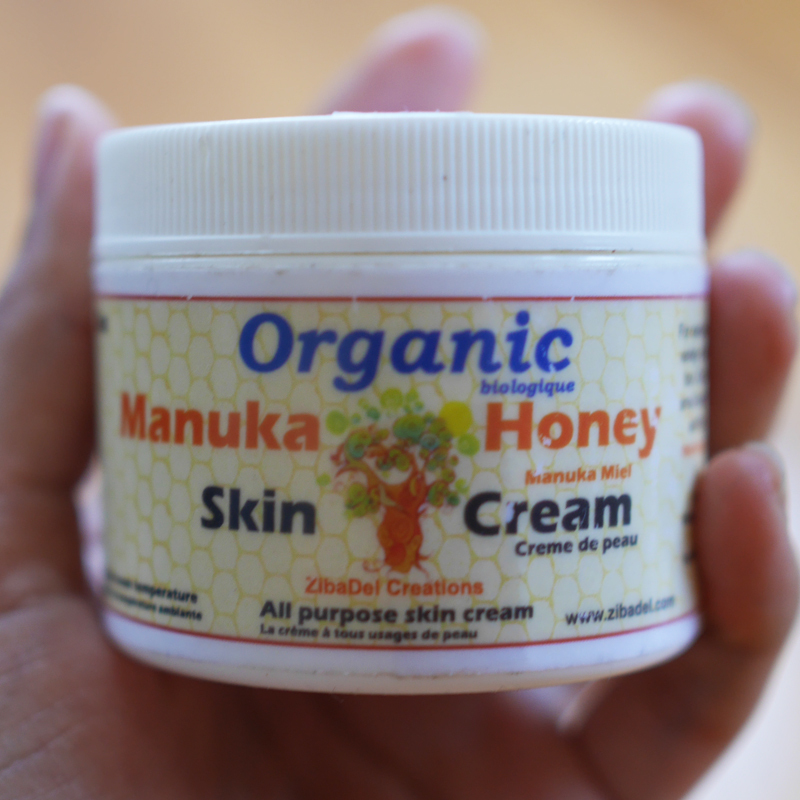 The Manuka honey in the cream is produced by bees pollinating the native Manuka flower bush. The antibacterial component in Manuka Honey is called methlglyoxal (MG), and comes in high concentration from the nectar of Manuka flowers. 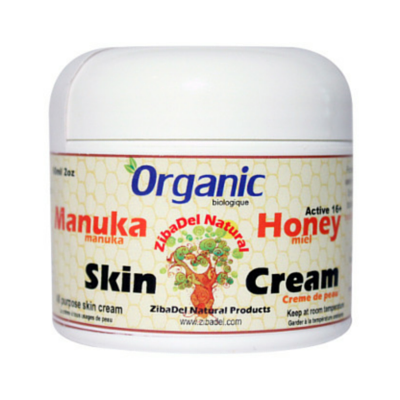 The Manuka honey and Manuka oil in the cream are very powerful at fighting bacteria and inflammation, and soothing dry skin. This is also an excellent cream for young ones who are prone to rashes. If you’re looking for an all-around moisturizer (that you can use regularly and that doesn’t contain any chemicals! ), this may fast become one of your favorites too! As I mentioned in the beginning, I really admire what this company stands for. Its founder, Jennifer Roberge (above), knows first-hand the struggles of itching, sleepless nights, and the frustration of managing eczema, when her son developed eczema at 3 months old. She tried countless eczema creams, lotions and clothing in her quest to clear his eczema. As a result, she opened up the Eczema Company — a way to share the products that were most successful! Jennifer is also a friend of mine, and when I told her I was writing a review, she offered to give a special discount just for YOU, my readers! Use the coupon: flawless10 to get a 10% discount off your order. This coupon is valid for all of the creams above, and can be used until the end of Sept, 2015. You can shop all 3 creams on their website: The Eczema Company. They also carry eczema-friendly clothes, wet-wraps, itch-mittens, and all types of different things to help soothe eczema. If you haven’t checked them out, do so now and use the coupon flawless10 to save on checkout! Are you excited to try these natural creams? What do you use for your eczema? Leave me a reply below, I’d love to hear from you! What if you have all these type excema ‘ s going on. They rotate? Then which is the best or all of them to use? I would suggest starting with Emily hot skin soother and the tallow (most prefer the lavender scented). That way you can soothe the itching/burns and hydrate the skin. Also, those two don’t contain sugar, which is good if you’re fighting topical bacteria. 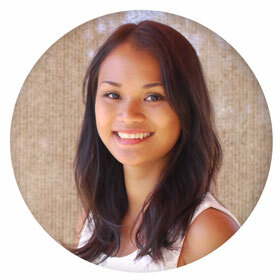 Christina – I have been following your posts and advise, but have seen very little about eczema on the face. I am 62 and have fair skin and have battled eczema for 50 years, but now my face is the most sensitive area. 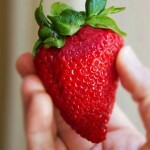 It becomes angry red, swollen, sore and dry for any number of reasons (diet, sun, heat, perspiration, stress). I try to avoid all steroid creams for my face as they are too strong. Would you recommend Emily’s Hot Skin Soother for facial skin? I don’t mind greasy, and really would like some relief. Hi Cass — if your eczema is red, hot and inflamed then the Emily Hot Skin Soother can work for you. It’s made out of herbs to help lessen inflammation. Check the article for a link to the product and use flawless10 to save on checkout! Hope it can provide you some relief. I’d like to try the Emily cream as you recommend but like Cass my eczema is on my face, my eyes in particular. Its so sensitive and cracked- is it ok for the eye area? Hi Vanessa — Eyes are sensitive so I’m not sure if I would recommend putting it directly on the eye area. Here is the list of ingredients, if it helps: Organic Sunflower Oil, Beeswax, Frankincense, Red Peony Root, Dictamnus Root Bark, Phellodendron Bark. How bad are steroid creams? I use Triamcinolone Acetonide Cream. Tried different ones, but this one seems to work the best. Am I better off with the natural creams and are they as affective? Thank you. Hi Kev, they’re very bad! — But as you know, my mission is to fight eczema without steroid creams. 🙂 Steroid creams can alter your skin barrier, mess with your hormones, and make you more susceptible to other allergies, including allergic skin conditions (in fact, if you look at the warning label at the back of your steroid cream or on the paper that comes with it, you can see it written there). Natural creams are very effective for eczema symptoms (dry skin, itchy skin, etc.) and at least you won’t have any of the negative side effects found in steroid creams. Do you know of anything similar to Emily heat cream that i could get here in the UK? I’ve been dealing with post-inflammatory hyperpigmentation due to my eczema on my back and was wondering if you recommend any natural solutions for it. Thanks! Hi Christina. I have found that your articles really help me but sometimes I still get the urge to itch especially during the night. my eczema has gone extremely bad. I visited the website for the creams that you recommended and I read the reviews. they say that the product is good but it doesn’t heal the eczema. could u recommend any products that will actually heal the eczema please? Hi Amy, glad the articles could help! 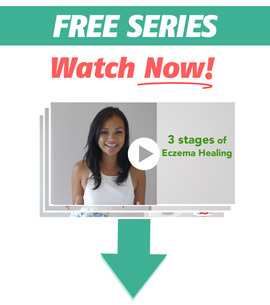 I’m not sure if I know of any cream that could heal eczema in the way that you’re asking for… From personal experience, I think if you really want to clear eczema for good then it’s more of a lifestyle change. Feel free to check out my program if you’d like more help with that! Oh man, I’m so glad I saw this article! The Flawless Program helped me clear up my awful eczema and stop using steroid creams altogether. It’s been a year and a half since I last used them and just now am I getting some eczema again (it’s my own fault, though, since I’ve had too much dairy again, which I learned is my trigger). Anyway, I was trying to treat the bit of eczema on my hand as if it was primary eczema and thinking the crusts were a good thing (like they were when I was first going through the steroid cream withdrawals). Of course it makes sense that this weeping is different! Just stocked up on everything you suggested and I’m crossing my fingers! Thanks!! What kind of shampoo and conditioner would you recommend for those with eczema (and where can you buy them)? Really love your website, very informative. Will definitely try some of your suggestions. Just wondering how these creams will help when you say the skin needs water not fats or oils. What percentage of Epsom salts to water do you use? Just started on 25mg Prednisone ( 7 days) as could not stand the pain any longer. Did not want to take this.